American Red Ale, Red IPA, Hoppy Amber Ale, taxonomy aside, I think it’s a great style of beer, especially as a fall seasonal. As the days get shorter and the leaves turn to hues of red and orange, it seemed befitting to create a hoppy beer that has a nice toasty malt flavor and a little more heft than I typically like in my hoppy beers.This sounds infinitely more appealing than the overly spiced pumpkin beers that tend to corrupt the season. It is also a great opportunity to clean out the freezer of last season’s hop crop in anticipation of the upcoming harvest. This is truly a harvest beer as it pertains to the ingredients found in typical beer. Huh, maybe Harvest IPA is the right classification. Mind you, this should absolutely not be a sweet beer. Nor should it have too many deep caramel flavors that are better suited in beers where hops are not playing the leading role. This recipe focuses on the toasty and biscuity flavors imbued by melanoidin rich malt rather than leaning heavily on crystallized caramel malts. The beer finishes very dry, giving the beer a high level of drinkability as well as the requisite ability to warm you from the inside out (a key requirement for the fall season). Medium to high tropical fruitiness—overripe mango, pineapple, Juicy Fruit gum. There is a very low caramel malt nose, much less than the color would indicate. Underneath the hops, there is perhaps a touch of lightly toasted bread. The hop combination is primarily fruity / tropical with just a hint of pine resin. Very clean fermentation. No alcohol. Medium brown with a reddish tint, though I’d really like the color to pop with a more saturated red tone. The beer is hazy, but not milky. The beer has a great tightly bubbled tan head that persists until the pint is finished. There is quite a bit of nice malty character on the palate that is slightly sweet with some nice toasty / biscuity flavors and just a touch of toffee. Somehow, given the high level of attenuation, there remains just a touch of sweetness. The beer has a very firm bitterness that is tempered by this slight amount of residual sweetness. Medium body and medium-high carbonation with a fair amount of creaminess / softness on the palate. I am becoming more and more of a believer in the ability of hop compounds to produce a certain lusciousness in mouthfeel for a beer. The bitterness is just a bit astringent / biting. I had a great time finishing this keg of beer. When super fresh, the beer hits you in the face with awesome bright hop aromatics. 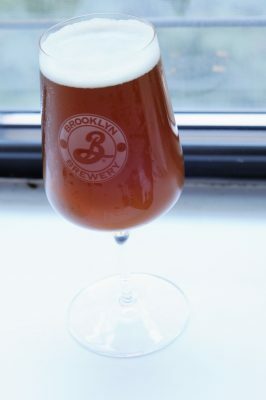 Over the period of about a month, the beer dropped bright, much of the punchy hops settled down, and the beer became more of a showcase in balance and malt. It aged quite gracefully; not becoming less of a beer, just a different style of beer. I actually preferred the beer most after about a month of cold storage. This entry was posted in Homebrew Recipes, Homebrew Tasting, Homebrewing and tagged ale, american beer, beer, homebrew, homebrewing, ipa, recipe, review by Nick Ladd. Bookmark the permalink.